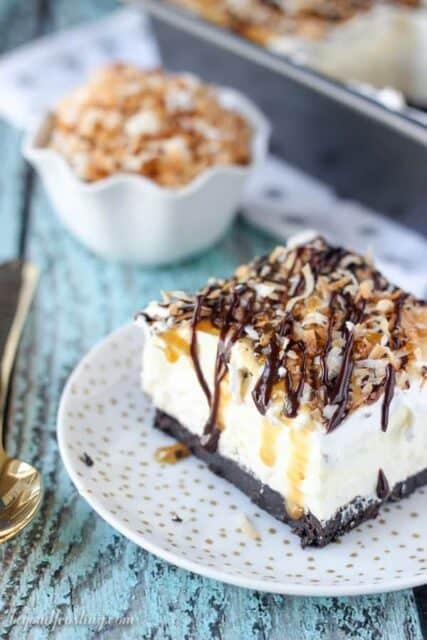 This Samoa Cookie Ice Cream Pie is oozing caramel and coconut. 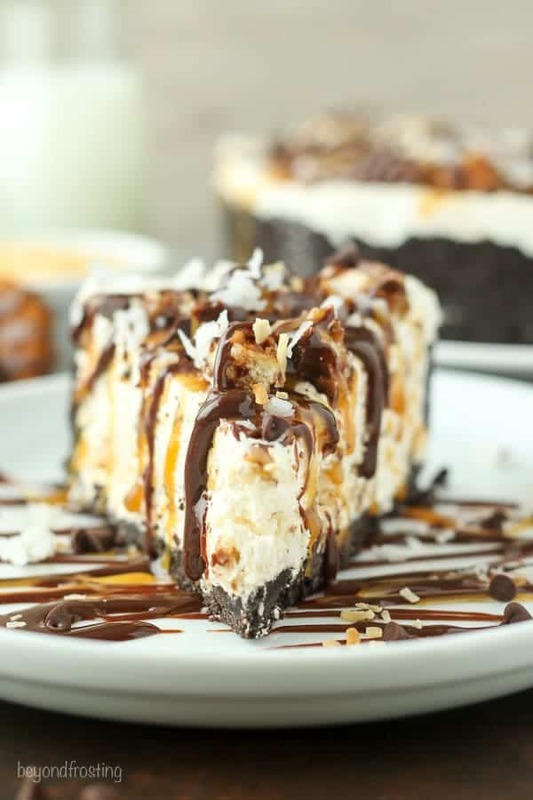 This has an Oreo cookie crust, with a caramel and coconut ice cream filling stuffed with Samoa cookies. This was originally posted in 2014 and has been updated in 2017, don’t miss the video recipe! 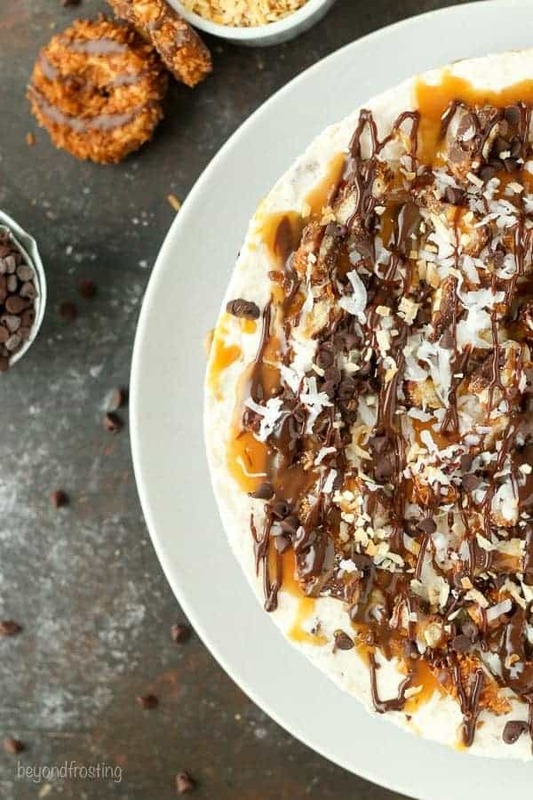 Before we talk about this Samoa Cookie Ice Cream Cake, let me tell you about how my weekend went. Did you all have a good Valentine’s day? I was showered with chocolate covered strawberries (my favorite) and roses and I made bacon mini burgers for dinner. All was well and dandy until halfway through dinner; the filling on my front tooth came out!! Do you all remember when I took a bad fall snowboarding on Christmas Eve and chipped my front tooth when I hit my head? Yeah, so I had a big filling on my front tooth and apparently those things can fall out again. There I was at 8pm on Valentine’s day with half of my front tooth missing. So my amazing boyfriend left to try and find me some sort of nighttime mouth guard so I could try to sleep more comfortably. In the meantime, I frantically called my dentist to see if he would be willing to meet me on Saturday and fix my tooth. Since he is the best dentist ever, he agreed to come in and fix me up. Also, have you ever tried to put chapstick on numb and swollen lips? Not recommended. I looked like I had two jolly ranchers stuffed inside my lips. WHY does this have to happen to me again on Valentine’s day and right before my boyfriend’s birthday? He doesn’t like when I tell people about his birthday, but it’s happening, today by the way (Editor’s Note: How dare you!). Well at least I have a temporary filling on my front tooth now so I can actually eat food and smile. I guess it could have been worse. It could have happened when I was in Colorado two weeks ago or God forbid at the blogging conference I went to in Utah last week. Still though, Valentine’s day? Really? As a result of my missing tooth, I could barley finish my slice of the Samoa Cookie Ice Cream Cake. Let me tell you, missing tooth or not, every freaking bite of this cake is WORTH it. 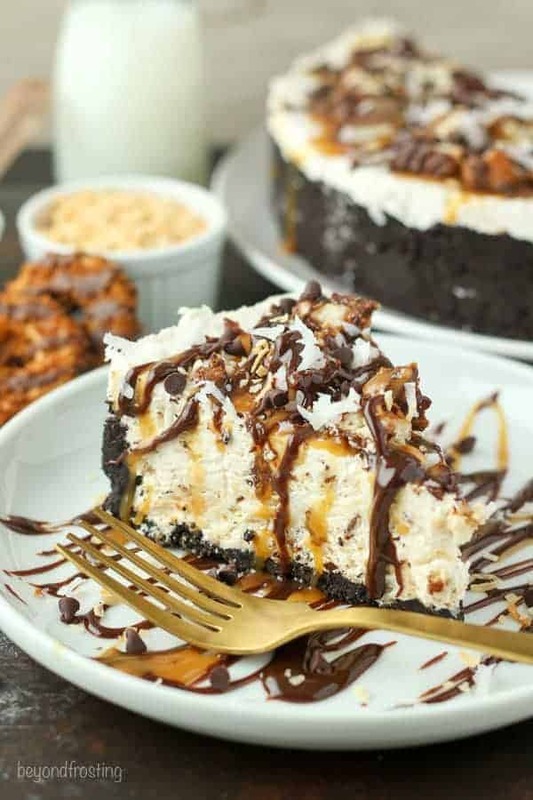 This has an Oreo cookie crust, with a caramel and coconut ice cream filling. 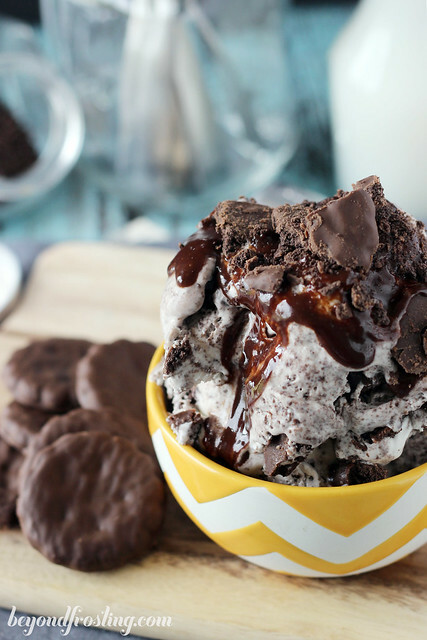 On top of that, there is a whole box of Samoa cookies mixed into the ice cream. Oh yes I did. 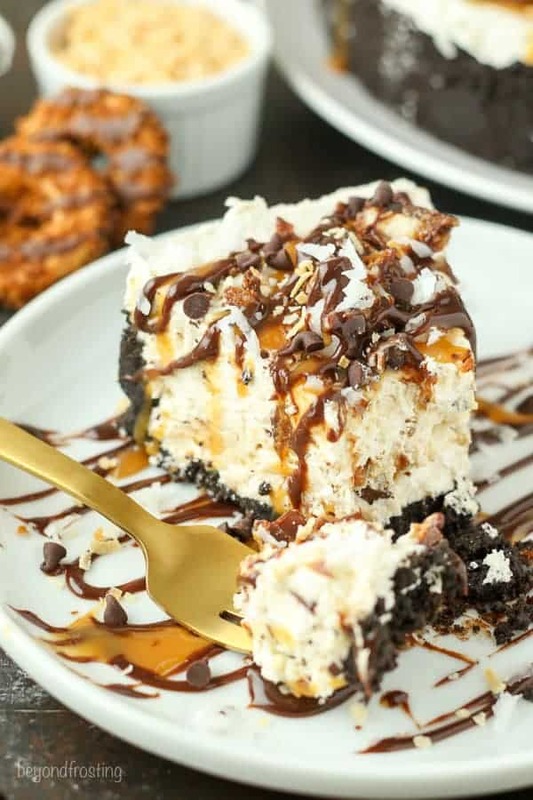 Once the cake is frozen, I topped it with more coconut, more cookies and completely smothered it in caramel and hot fudge sauce. 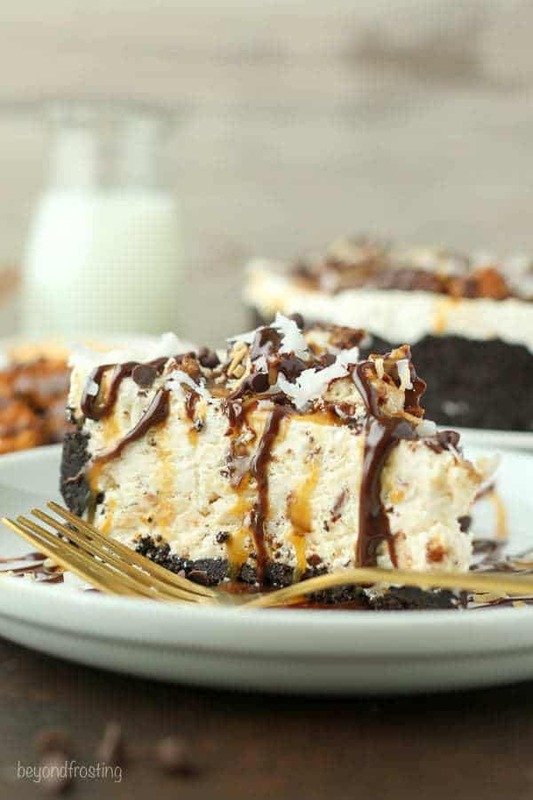 This ice cream cake is so dang amazing; the caramel, the coconut and cookies in every bite. 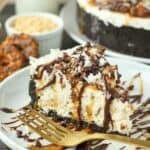 This ice cream cake is a no-bake dessert, which means very little fuss! 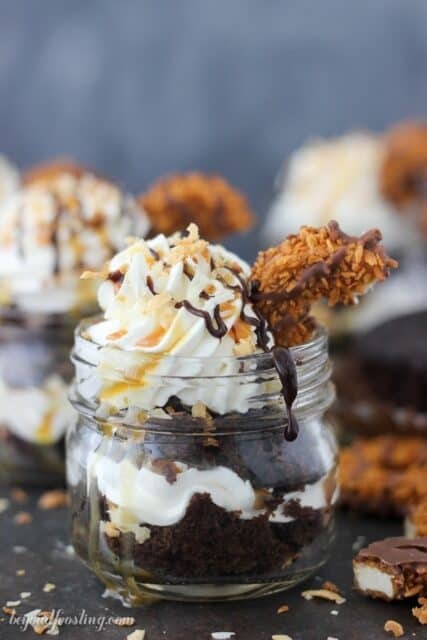 You will need at least a full box of Samoa cookies for this recipe, but a box and half is best. 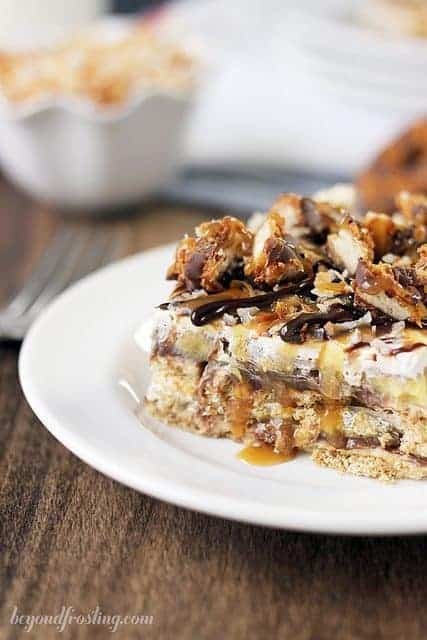 You will also need the makings of a Samoa cookie such as coconut, caramel and chocolate. I made my crust with Oreo cookies and butter. The ice cream is made with a cream cheese and whipped cream base. It takes about five minutes to throw together and a couple hours to freeze. I used a spring form pan to make this cake so I could easily remove the outside and expose the crust. This will also help make cutting the cake easier. However, it is not required to make this cake with a spring form pan, you can also make it in a pie pan. All toppings are totally optional. This cake is still amazing even when it is not smothered in caramel, chocolate and more cookies. The idea for this cake was inspired by my friend Lindsay at Life, Love and Sugar. She has some of the most amazing ice cream cakes I have ever seen! I had the pleasure of meeting Lindsay last weekend in Utah, and we bonded over our love of sugar. We started our blogs within a few months of each other and after months of commenting back and forth, we finally got to meet! Whip cream cheese in a mixing bowl for a few minutes until light and fluffy. Add sugar and continue to beat until sugar is dissolved into cream cheese. Add milk and caramel sauce and mix into cream cheese until well blended. Cut up a box of cookies into small pieces, about the size of a dime. If you don’t have a second box, reserve 6 full cookies for the top of the cake. Add cookies and shredded coconut to the cream cheese mix and fold into mixture. Add Cool Whip and blend all ingredients until well mixed. Pour mixture into spring form pan. Spread evenly with a spatula. Put ice cream cake in the freezer for several hours. I froze mine overnight. When ready to serve, remove from freezer. Cover with additional coconut and cookie pieces. Drizzle with caramel and hot fudge sauce if desired. Is the shredded coconut sweetened? Cannot wait to make this! Hi Jill, I always use shredded coconut. Enjoy!